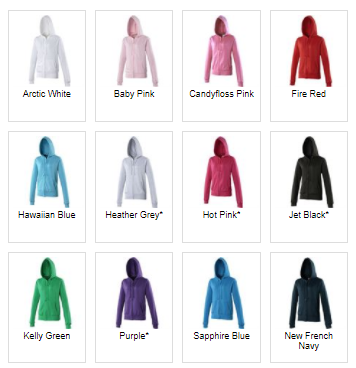 Full zip hoodie with girlie fit. Covered main zip with self fabric and twin needle stitching detailing. Double fabric hood with self coloured cords and kangaroo pouch pocket. Right hand side pocket has small hidden opening for ear phone cord feed with hidden ear phone loops. Ribbed cuff and hem with deep hem and ribbed main pocket edge detail for comfort.